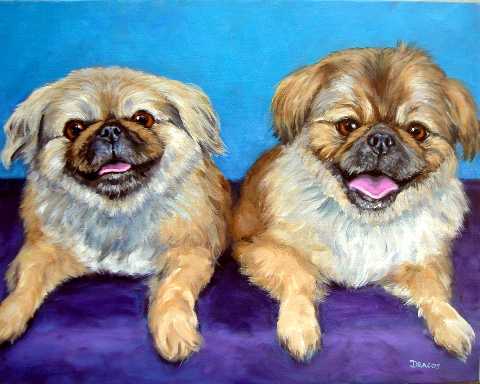 Here's a commissioned painting I recently finished, which includes two pekingese sweeties, Parker and Gizmo. They're beautiful little guys, and I really enjoyed doing the painting. Hope everyone had a great Thanksgiving Day yesterday. We did at our home. But now I'm stuffed! Believe it or not, I'm still trying to settle into a new life here in Central Florida after two months. I've kind of found my way around but actually am preferring to stay right on my own little piece of land and play with gardening. And now I understand why there are so many snowbirds alighting here each winter: This place is heavenly -- this time of year, at least! I sat outside for hours a couple of days ago, in November!! !, without even a sweater, and watched the sun go down. It is beautiful beyond words here, and really, the weather is perfect! Neither too cold nor too hot. And the colors! You wouldn't believe the colors of the sky, the trees, the shadows - it makes me wish I were a writer so I could describe them vividly for you. Soon, very soon, I'm going to have my schedule cleared enough that I can start doing some paintings of this region of the world. In the meantime, though, I am overloaded with commissioned paintings that all have a looming deadline. 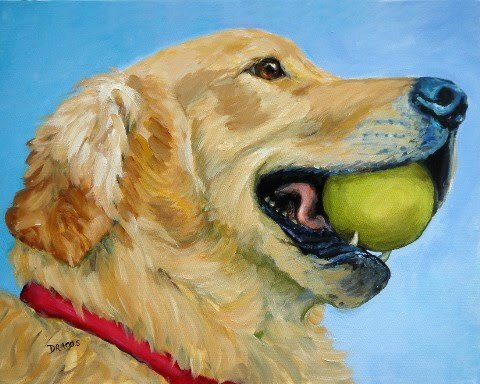 The painting shown here is one of two that I did for a client very recently. 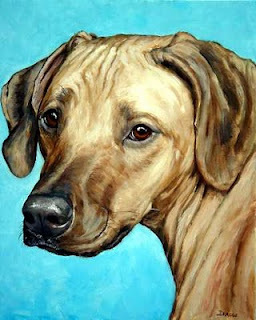 This is a beautiful Rhodesian ridgeback, named Matilda. Her adopted brother, Henry, a handsome weimaraner, will be shown in my next blog entry. I've been thinking a lot lately and reading a lot, too. Yes, I know I should be painting, but one has to take a break from time to time. One of the thought-provoking things I read is a biweekly newsletter all about art and life, too, because they're closely intertwined. It starts with an interesting, thought-provoking essay and is followed by comments from fellow artists, including examples of their work. I look forward to it twice a week. I may have mentioned this newsletter before, but it merits another mention if I have. Here's the address: http://painterskeys.com/, and it's hosted by artist Robert Genn. To receive the newsletter, you have to actually request it at the site and confirm your request through the email you'll receive. I very highly recommend it. Also, artists can pay to have their artwork featured through the website, and I was just randomly looking through some of the artists' listings and came across this artist: http://painterskeys.com/pal/christine_hanlon/ - and was just blown away by her work. What a great inspiring artist this person is! And I discovered this person literally by just a random click on a name. Give her work a look if you have the time; you won't be sorry you took the time. Okay, speaking of time, I guess I better get back to my own paintings! Okay, I'm back! My move has been accomplished, and I'm just getting back to work. 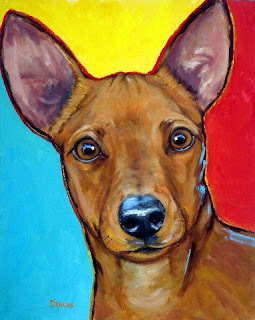 Right now, I'm testing a shopping cart feature of my new favorite venue (see earlier posts to read all about it) Artfire. The image you see above my notes here allows you to buy this painting directly from my blog. I tried to get it to work on my website, but I've been unable to. I'll keep trying. If not, I may have to get a new website host because I love this feature from Artfire. Because I've been out of touch for a couple of weeks, I have to keep working right now. But I promise very soon to talk about the move. For now, at least it's over! I've been awfully busy lately and will continue to be for at least a few more weeks because -- along with my daughter, son-in-law, and little eight-month-old Elena, my granddaughter, we're moving to Florida at least for the next few months where my daughter and son-in-law have a house they're trying to sell. We'll still have our house here in Oregon, too. I'm finishing up two commissioned paintings I've been working on, and I'll try to list images of them when I'm finished with them, but that may have to wait, too, because after next week, I'll pretty much be without a computer. I'll have my laptop, but it's old and very, very slow. If you're one of the people who have commissioned a painting with me more recently, you probably already know all this information; but if you somehow missed it, that's one of the reasons I told you that you won't be getting your painting until either early or mid October. By then, I should have at least a functioning studio set up and be able to paint again. The scariest part of this whole move is this (I'll take any suggestions, advice anyone is willing to give, too! ): My daughter and son-in-law are traveling by vehicle across the country (from Oregon to Florida), and a week later, I'm flying with Elena so she doesn't have to be in a car seat for days on end. We've been doing what we can to prepare her for being without her parents, but the whole thing is really scary. We've gotten her used to formula in the past few days, and she seems to like it fine now. Sleep time, I don't know how that's going to work out because (against my advice!!! only joking - a little bit) she sleeps in the same bed with her parents, so I don't know how she's going to be with me there instead. The flight is a bit scary, too, but I've been reading advice online about how to handle it, so I guess the good news is it'll be over in a few hours, even if she screams the entire flight. Poor, poor fellow passengers . . . Maybe it'll go well. I'm taking lots of new toys, the formula (I guess I can maybe get warm water from the attendants? If not, I guess she'll have to drink it cold, the baby carrier, a changing pad, diapers, wipes, a change of clothing, snack foods for her. Anyway, that's why I haven't been posting any images lately! Wish me luck! 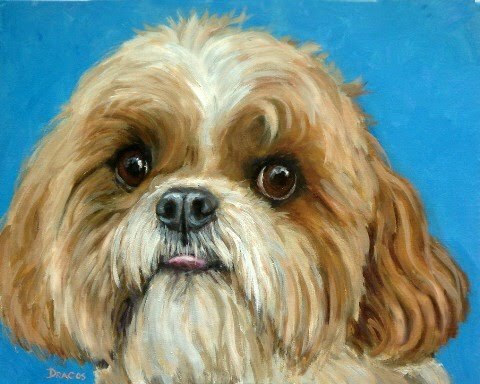 This is a little custom shih tzu painting I finished a few days ago. It's already on its way to Bankok, Thailand where the real little guy lives with his mom, who was visiting in the US and asked me to paint her little pup that she missed terribly while she was here. 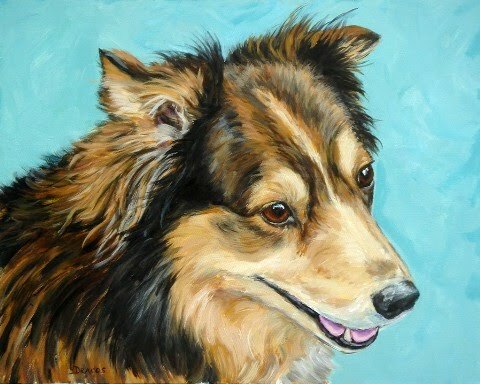 At present I'm working on a couple of paintings, one for a contest winner from the June photo-submission contest (the contest is on hold for now due to my huge workload), a Nova Scotia Duck-Tolling Retriever, which should be finished in a week or so more. I'm also doing a formal painting of a show-groomed Yorkshire terrier, which is coming along nicely. It's due the end of this week, so I don't have time for much of anything else. Then I have four or five, I think it is, custom paintings that have to be done one after the other just as quickly as I can do them (it takes me about a week for each painting, unfortunately). Starting in the next few days, I'm going to try to start listing interim photos of my paintings in progress. I've been shy about doing that until now, but I think it will help me and perhaps others. It'll be good for me, I think, because I can perhaps see some method to my painting madness if I see some paintings in stages of completion. We'll see how it goes. Actually, I think my daughter, Lara, has already posted a few progress shots of the Toller mentioned above that I'm working on as I can squeeze it in. 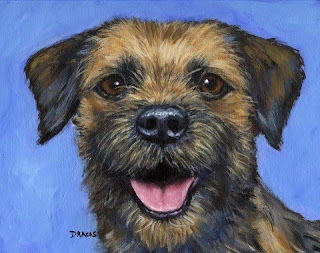 You will note on the progress photos that since these paintings are for the most part custom portraits and have to be very, very precise, that I draw a grid on the photo I work from and a corresponding one on my canvas. It really helps me keep everything exactly where it ought to be. I highly recommend it for portrait work. I could work without the grids, I guess, but it saves me a huge amount of time. Okay, back to the Yorkie now. I really like this painting! I just finished it yesterday, and it's being picked up this weekend. 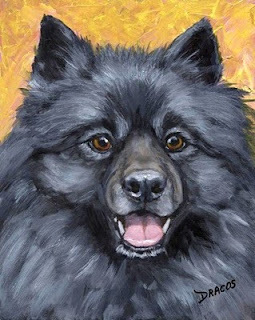 It's a custom painting of a beautiful young guy named Barolo. Obviously, the original has been sold, but prints are available on my website. Some days I think I'll never "get it," and then I get a painting like this that give me hope. It's got good color, is "realistic" but not overly so, still "painterly," in my opinion. Oh, and by the way, the "paw print" on his chest is real, not something I stuck in. Pretty neat, huh? A week ago I re-started doing small daily paintings. I was really going to do it this time -- but I'm not, after all. It just doesn't work with my personality - and my method of painting, which is, I'm sorry to say, of a more laborious, yet relaxed, style. I wanted to learn to paint faster, looser, (more profitably?) -- but I have to conclude that it's just not in my personality or painting style to do so. I still found myself painting a bit too ambitious, albeit smallish, paintings - and feeling frustrated that I was spending way, way too many hours on them, and yet still not completely satisfied with the results. I don't know what drives me sometimes. 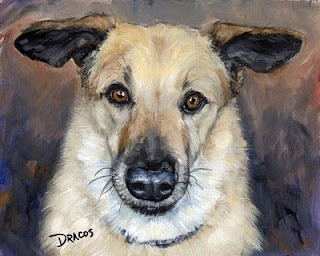 I'm "of a certain age," heading into retirement kicking and fighting all the way -- but, as I've been all my life, I still have this drive to master whatever my chosen goal at the time is - and for the past several years and I think for the rest of my life, it's been painting. I've mentioned before, maybe not here but in my other blog, that I've had a few careers in my very interesting life, some of which were quite demanding (i.e., neuroscience/experimental psychologist, self-taught and highly successful court reporter, highly successful ceramics artist, to name a few notable ones). But none of my careers prepared me for the challenges or frustrations of being (becoming) a full-fledged, accomplished painter. It is by far the hardest path I have chosen in my life -- and yet the most rewarding when I "get it right," which amazingly I sometimes do. Well, I don't even know exactly where this post was headed when I began - except to say that I'm giving up the daily paintings again and feel that it's the right move for me. I need to continue to explore and learn and paint for as long a time as I feel I need to on each and every painting to "get it right," even if it isn't the most profitable method of working. It just feels right for me, and I think that's important. And, so far, my happy clients and customers appreciate the work I do. So for now at least, I'll keep painting along in my own slow, probably not-too-efficient style, and loving every second of it. Now for another cup of coffee and a little while with a good art book. Here's my painting for today -- again, too ambitious. It's #6, painted July 22, 2010. I think I did okay on it, but it took way, way too long and didn't allow me to do my regular work, too. But it was a lot of fun to learn, and I can see that I am already learning tons more than I was learning by just doing custom paintings. This difficult grind of doing a painting a day I think is going to pay off in huge rewards after even just a few months. I'm not claiming at all to be even a half-good painter, but I think that by learning and studying and DOING (Nike was right with their "Just Do It" slogan), I'm going to progress to be a better and better painter much more rapidly than I would have if I hadn't undertaken this endeavor. Let me know what you think. I went to the bookstore today and bought another art book, this time on color theory. It blows me away. You know what, I studied neuroscience for nearly five years in graduate school, and this study of art makes that seem like child's play --- seriously! This is a lot of complex stuff to learn and then to keep juggling it all in your mind and through your hands while at the same trying to do a painting - really, it's amazing that anyone can ever, ever master it all. But I love, love, love a good challenge - always have - and this is the best and most difficult one yet. And it'll take me the entire rest of my life to even begin to begin to grasp it. I can't remember who it was, but some really accomplished artist was reputedly said to have stated right before he died something like "and I was just beginning to get it." I know that's very crudely paraphrased, but you get the idea. Well, anyway, this painting and print are both listed on my website and on my Artfire studio (yes, I'm starting to use it more and more as a "gallery" to showcase my artwork). Here's the link: http://www.artfire.com/users/LarkStudios. Okay, onto that subject, Artfire, as I've mentioned before, I am getting to like it more and more all the time -- but I still am not selling well on it. I'll let you know if and when that changes; I expect it will. As I may have mentioned before, there's a way to have it be the "store" for my website, some sort of seamless linkage. When I have the time to figure all that out, I think it will really pay for itself (which it has to do at some point or I'll have to drop it.) But again, I expect it will before too long. Go easy on me with this one. Hey, I finished it today, and it's not as complicated as yesterday's. But I'm not crazy about it. Maybe I shouldn't be saying that about my own work; but again, I promised to put up everything I do - good or bad - during my Daily Painting run. I know I need to loosen up, so that's what this one is all about. Anyway, here it is. 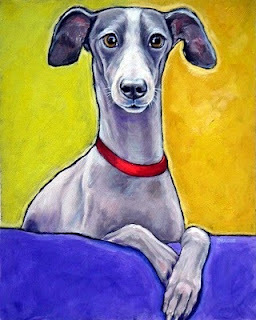 It's an Italian greyhound face on 8x10x1" wood and will be available for sale on my website later on this evening. Don't everyone rush to get it 'cause I only have the one! Today's Daily Painting was a bit too ambitious, so I'm going to have to be a little more careful in what I choose to paint in the future for my daily paintings. It took me nearly all day to paint it, and I still had to work on commissions, too. So I'm tired! 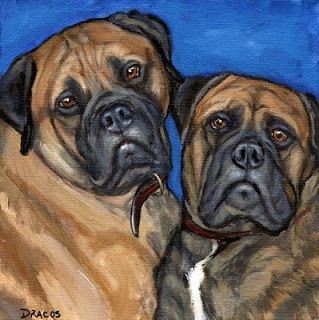 These two sweetie mastiffs were painted from a photo sent to me, believe it or not, years ago from someone I met at Portland Saturday Market. Unfortunately, I have had a couple of computer crashes since that time, so I do not have the person's name. 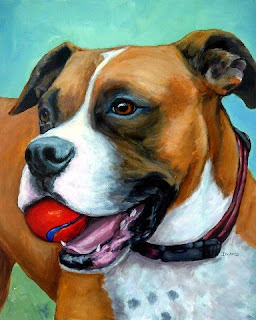 The painting is 8x8x1.5 on gallery-wrapped canvas, with the sides painted the same blue as the background. It's for sale on my website for $50, plus shipping and insurance of $6. Okay, here's Day 3 of my daily paintings. So far, so good, I guess. This is mighty stressful, I might say, but I'm going to keep it up. (However, in the next five or six weeks, I'll have to take a week-or-two break because I have to travel - by car - across the country -- again! This will be about the thousandth time, I think!) But for now, I'll continue doing my paintings a day. 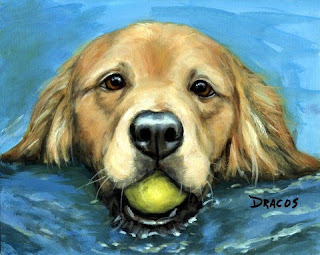 This is a golden retriever, swimming with a tennis ball in his/her mouth. It's for sale, of course, $50, 8x10x1" on prepared wood, with the sides painted the same color as the water, wired and ready to hang. You can find it on my website listed above. Yesterday, I painted this little group of flowers that I found in a neighbor's yard. I don't know what they're called; I just thought they were pretty. I don't think I really did them justice, but I felt, again, that if I'm really earnest about doing this painting-a-day thing, that I should list each and every one I do, even if I'm not particularly proud of it. Even though it's not the best thing I've ever done, I did get some pleasure from painting it -- and I learned something very valuable: painting something outside my "comfort zone" is much, much more challenging than I ever thought it would be. Wish me luck on my new little venture. I don't know how long I'll make it, but I promise I will give it my very best effort one month at a time. How about that? One month at a time. And I'll continue to list both the good , pretty good, and not-so-good ones, too. 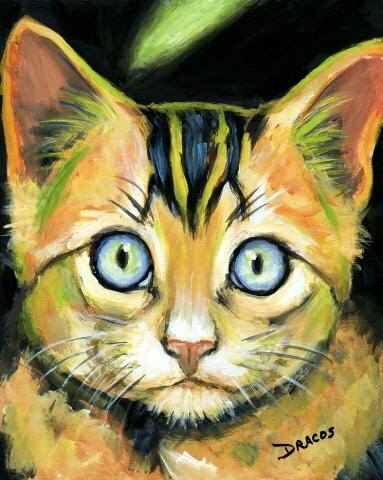 Okay, I'm really, really liking Artfire these days - and I think I'll continue to do so the more I get to know it. It has a lot of great functions that I haven't found elsewhere, the artists/craftspeople on there are extremely generous with sharing their support and knowledge with each other -- and I'm finally starting to get sales. I think this venue is a keeper - and at this time, July 2010, I highly recommend it. As I may have said before, I first had a "basic," reduced-function membership at no cost. But I received an offer from them for a $1.00 fee for "Pro" membership for the month of July, no contract required, so what did I have to lose. I have really worked it hard this month and will continue to do so. I have had only a few sales, admittedly, but I see real potential here. And the price is certainly right -- if I continue to have more and more sales. It's $15.95 a month, flat fee, and no percentage fee with sales, just the flat monthly fee. That's it. I will add one thing, though: This site definitely has to be marketed. It doesn't have the following that Etsy has, nowhere near it. But look out! I think if things go as it appears they're going on it, it's going to be well-known someday. I'll continue to report on it and the other venues I've been checking out as time goes on, but so far, it's my favorite new one. 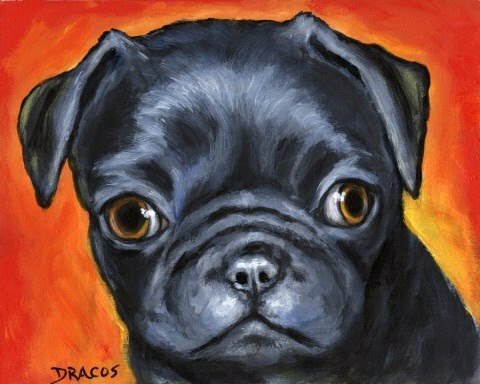 This is a little 8x10x1" black pug puppy painting I did today. It's acrylic on wood paneling with sides painted the same as the red background. 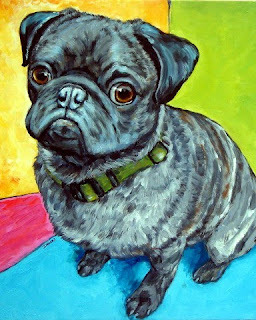 It was a pleasure to paint, as are all pugs -- and I know because I do paint a lot of them. 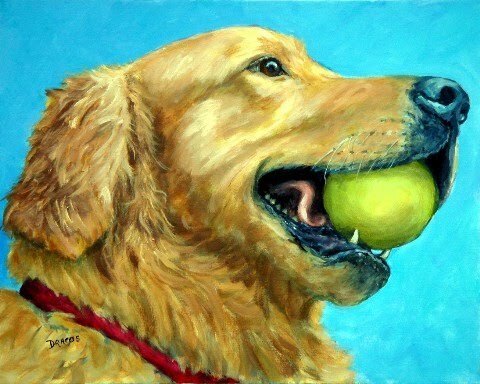 I've never had one, but I've had the great opportunity to meet many of them in my dog-painting career, and I find them to be very friendly, gentle, outgoing but calm dogs. I won't mind it a bit if I find myself with one someday. As usual, the prints are available on my website, and I also have the original listed there as well. A quick note: I no longer sell the pendants from my website, but they are for sale on Artfire. Okay, I know this has nothing to do with painting, but I just finished the most miserable camping trip - ever (well, almost ever, anyway). We went to Crater Lake to spend a few days, got there in the afternoon, started setting up the tent, and realized there were massive swarms of mosquitoes (think Hitchcock's birds but substitute mosquitoes), attacking us as if we were their last chance at avoiding certain and imminent starvation! Really, when one of us was in the sun, there was this aura of the blood-sucking creatures floating around the entire person. We thought it was because it was a bit late in the day, so we stuck it out and stayed the night -- after we killed around a hundred of them that had gotten into the tent. The next morning, at around 5 am (really! ), we thought everything was great - no mosquitoes. But by around 6 am, they were out again! They were even diving into my "camp coffee" as I tried to boil it. No kidding; I've never seen so many at once in all my life. So we took a hike and came back around 11 am, and they were still there, in full sunlight. By 2 pm, as we sat huddled in the tent slathering ourselves once again with $11-per-bottle mosquito repellant bought at the camp store, we decided just to give up and leave -- forfeiting our prepaid nights at the campsite but saving what little blood we had left. We counted the number of bites on my daughter's back when we finally got back home, and she had 22 bites just on her back. Anyway, it was quite a disappointment. We're going to try the coast next time - it's got to be better. Okay, thanks for listening to me. I feel much better now. But I don't think I'll ever go back to Crater Lake again. Let's hope the coast is better. Here's a cute Italian Greyhound painting I finished just yesterday morning. It's acrylic painted on a 16x20x3/4" staple-free canvas and is available for $150 plus shipping of approximately $12 (includes shipping insurance). As usual, it's being sold elsewhere, too, so let me know if you want it and I'll send you an ebill and pull it from the other location. 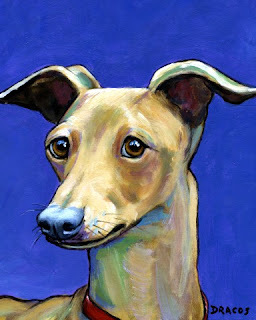 I'm also doing a small head shot of a yellowish Italian Grey, too, which will be done probably by the end of the week. Well, I don't have a whole lot to report at this time. 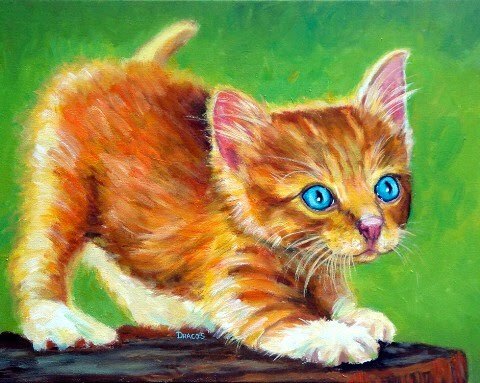 I got a couple of sales on Artfire.com, but they were to other artists/vendors on the site - due to my having made comments in the discussion forums. Absolutely no "outside" sales. However, in fairness to artfire, I haven't had (or taken) the time to do much marketing, either. I'll keep working with it, I think, though, just to see how it goes if I give it more of a chance. Lest you think I haven't been painting lately, I truly have. 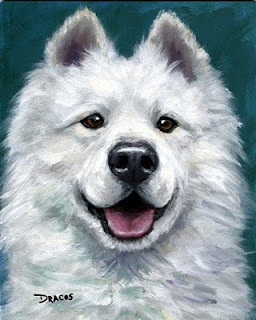 It's just been almost all commissions, which often don't appeal to much of anyone other than the pet's family member who commissioned the painting. 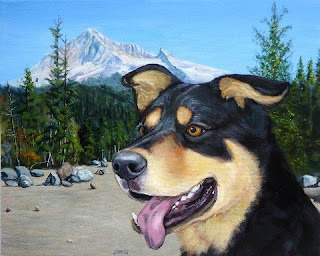 Here's one that I feel might have a bit more universal appeal, though: It's a painting of a rottweiler, named Porter, whose family love the outdoors, especially being up on or around Mount Hood. This is Porter at an area where his family like to go camping; that's Mount Hood, in the Oregon Cascade Mountains, if you're not familiar with it. I like this painting for a couple of reasons: First, it's my first real landscape painting - yeah, I know, but I've been so busy with animals that I really haven't had the time to do any landscapes. That's going to change soon, though, because I'm really, really eager to do more now that I've had a taste of it! 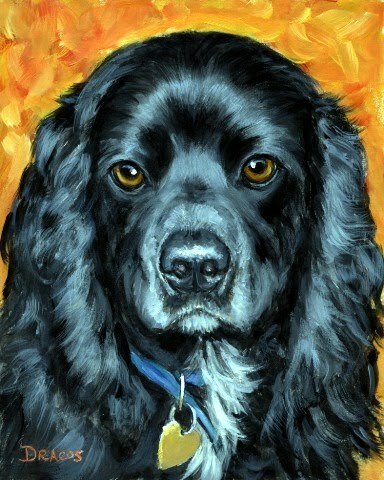 Secondly, I think Porter is a beauty, and I really enjoyed painting him. Note those dark spots on his tongue. They're not shadows but actual dark markings. Anyway, hope you like it, too. It was a great pleasure to paint. Sorry I haven't been writing much lately. I've been really busy with custom paintings, and they're still coming in. But I did want to give you a quick update on my "research" on the above-mentioned two online venues. First, I can't even tell you exactly why, but I just haven't had a good feeling about 1000 Markets - it seems very restrictive, I think is one of the main things - so I've kind of dropped it at least for the time being. I haven't closed my "shop," but I'm just not doing anything on it. But Artfire, I have a much better "feeling" about, and I plan to give it a really good try. I've had a couple of sales - I know, that's not much, but, hey, feelings count for something. And the other sellers on there are just so nice and extremely supportive. Example: I was really frustrated that I hadn't sold anything after having been on there for around two months, so I researched around to find out how to move my Etsy listings over there -- and managed to move them, all 500-plus of them. Still no interest - or sales. So I wrote a plaintive request for what I was doing wrong, not doing right, whatever, on their forum - and got around 45 responses, all very supportive, informative, and encouraging. Plus !!! I sold a couple of items to other vendors. And, after having done some of the "tweaks" that were suggested to me, I'm getting a lot more traffic, too. Let me go over a couple of reasons why I really like this venue: First of all, they're not at all restrictive, like the 1K Markets site - or even Etsy for that matter - about your promoting yourself within their site regarding other venues you sell (such as my own website, etsy, facebook, whatever, there are absolutely no restrictions on that kind of self-promotion.) In fact, I think it's even encouraged. Secondly, although for my first couple of months I had the absolutely free online shop on artfire, they made me an offer I couldn't refuse: $1 fee for the month of July and no commitment to do more. So what did I have to lose. This site has absolutely no sales fees, no listing fees, just a flat monthly fee of around $16.00 (a few cents less, I think). I know I sell quite well on Etsy, so consequently my fees are rather high, but I'm hoping someday soon to sell well on this site, too. The big difference I see in this venue and Etsy now is that Etsy has earned a big name and a really big presence in the online world - thus lots and lots of traffic; this venue does have the big name, etc., and thus not lots of traffic - yet! So you have to promote it -- and, of course, yourself, through whatever means are at your disposal. I personally don't have a whole lot of time to promote myself on there due to my large custom workload, but I'm doing what I can. I'm telling customers at Portland Saturday Market where we have had booth for years about it, and I'm even going (haven't done it yet) to try to make use of it on my own website as a kind of "checkout" for website sales. I don't know exactly how I'm going to do that yet, but I think it will work very well once I get it figured out. Okay, I've got a huge commission that's due TOMORROW - YIKES!! !, so I better get back to work on it. When I'm done with that one, I think I can take a little breather and will list some of these custom paintings I've been doing lately. I haven't been able to do much painting on my own lately due to the customs, so I'm really hoping to be able to do my own thing again soon, too. Check out the two sites I've talked about and let me (and others) know what your thoughts are on them. Let's all help each other in this business of art/crafts. Well, so far, I don't have much to report on my testing of the two above art/crafts venues, 1000 Markets and Artfire. I've only listed a few items on each one and have gotten only what appears to be views from other people selling art or craft items on the sites. I will continue to list more items, though, and report back. I don't want to judge either site at this point because on the surface, at least, they're nice looking. I just don't know if they get enough traffic to generate much income. (But that could change in the future, too.) And although I do quite well on the biggie site, Etsy, and rather well on my own website, I would rather be able to sell more of my work online rather than primarily at art shows -- just easier. Although I might add that an artist's presence at art shows is essential, too, even with a better sales volume online. All this being said, I am first an artist and next a person who has to pay her bills. I have chosen to be an artist, and I love passionately what I do - but those darned bills still have to be paid. And if I'm going to stay at home in my studio and paint all day, every day, I've got to pay the bills with the results of my fun but hard work - i.e., my paintings and prints. More to follow . . . This is Lady. 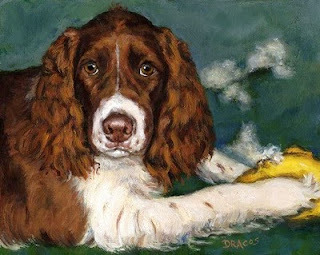 She's an English Springer Spaniel, and she's May's winner of a monthly contest we started last March. The winner of this entry, Missy Reynolds, Lady's mom, gets a free 8x10 print or a pendant, her choice. Plus, she gets first choice at the purchase of the original 8x10 on wood paneling painting for $50 if she so chooses. If she doesn't want the original, I'll make it available to the general public. So, in other words, there's no requirement to buy anything at all if you enter the contest - in fact, you get something free if you win. Also, if your entry didn't win in the month you entered, you have the option to contact me to say you're resubmitting for the following month. 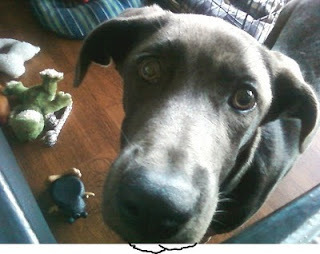 To enter your pet's pic(s), send high-quality photos (at least three) of your pet. We'll let you know at the end of each month if your pet was chosen. We, the family members involved in my business, vote on our choice; then the winner from the final three of those choices is drawn from a hopper. If you want more info on entering, just get in touch with me, dottie@wildwildthings.com, and either my daughter Lara or I will write you back with more info. Also, there's a lot more info on the contest on our facebook page, listed I think above this posting -- well, somewhere on here, anyway; I'm not really sure where. What do you know about 1000 Markets? This is a link to an online venue, "1000 Markets," that I'm giving a try. If anyone out there has any experience, positive or negative with it, I would love to hear from you. Okay, this is the last one I'm posting tonight. I'll try not to be so slow in posting my next batch of paintings. This is a really handsome young guy I met at a little art show in Corvallis, OR. I wasn't familiar with the breed at the time, and I was amazed, first of all, at his size, then at his gentle nature, his very soft fur, his sweet, sweet face. I could go on and on. I expect I'll be doing more paintings of Leonburgers in the future. So beautiful. I've posted quite a few paintings this evening. Do let me know what you think about them if you have time. I really appreciate all the comments I get. Painting is a lonely job . . . He looks an awfully lot in form like my little Pomeranian, Harry. I did some reading and found that they indeed are quite closely related, only quite different in size. 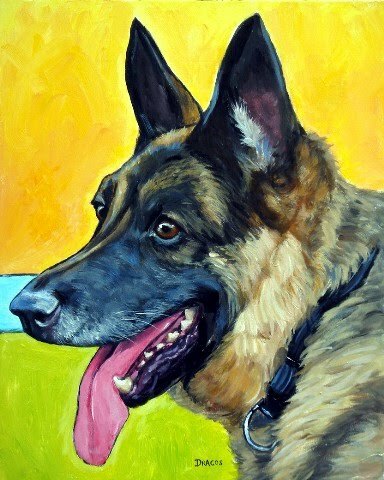 This also is a painting I finished this past week, today actually, and it's another painting done from a photo submitted by a customer. His name is Chico, and I think he's a beauty. 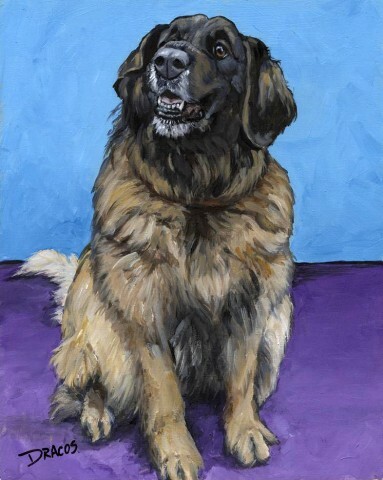 When I first painted him, I had him on a greyish-blue background - and it just didn't work. So I just "abstracted" the actual background in the photo, and I really, really like the results. 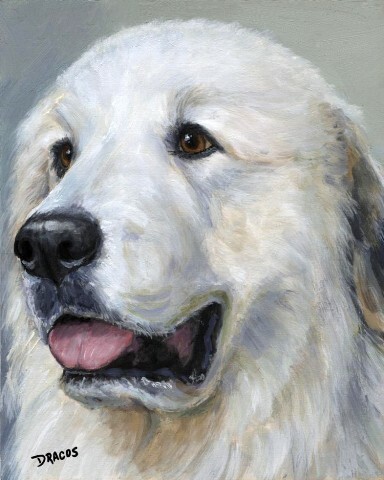 This Great Pyrenees painting is one that I just finished this past week. I'm quite happy with it. They're beautiful dogs. Nothing more I can say. It's painted from a photo submitted by a customer. Hope you like it. This is a painting I just finished today, and I really like it. For me, it is a wild departure, though, which made me really uncomfortable, I'm afraid. It's a bit more abstract than most of my dog paintings, but I think I needed to do this - be a bit more spontaneous, that is, in doing the painting. Scary! It's 16x20x3/4", staple-free sides, wired and ready to hang -- Sorry, this painting has sold. I should mention that, actually: I sometimes mention here that certain paintings are for sale. As my paintings are also shown in other venues, I cannot promise that they'll always be available if listed here. So if you're interested in a painting, just email me to check on its availability. Well, as you might notice, I'm listing these recent paintings alphabetically rather than chronologically -- but again, they all were done within a two- to three-week period up to the present. I really enjoyed doing this painting. It was a bit difficult for me, but I think it came out pretty well. 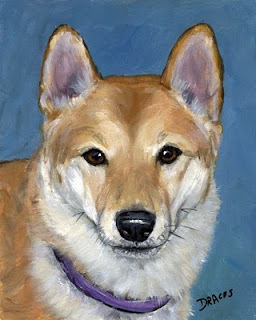 I love shorthaired dogs, especially to paint them, because you can see their body shape so extremely well. 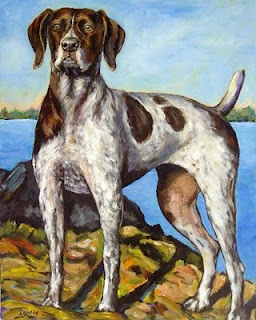 German shorthaired pointers are especially beautiful, and it seems that every one is different from any others. I had a magnificent best friend up until just a few years ago, named Dune, who was part GSP and part greyhound - what a beauty! And what a wonderful, wonderful dog and friend. I'll miss him forever. 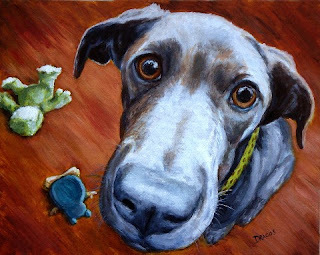 This is a small painting I did recently of a little dalmatian puppy I spotted and photographed (with permission) at Portland Saturday Market. He was so sweet looking to me. 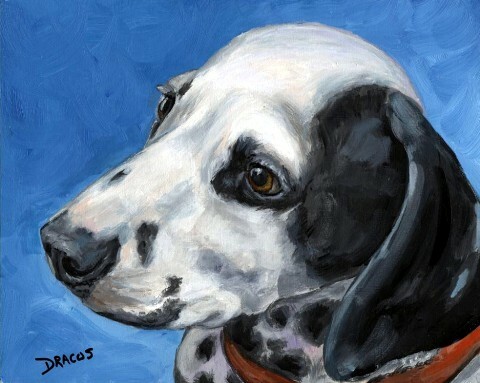 I used to have a dalmatian, so I have a soft spot for them -- well, I do for all dogs, actually. Anyway, he's on 8x10 wood paneling and is available for purchase at $50, plus shipping. Email me if you're interested in purchasing him and I'll send you an ebill. As usual, prints and pendants are also available on my website. This is a commissioned painting I finished about a week ago. Her name is Sue, and she is very much beloved. The recipient of this painting likes the color orange, and it was requested as the background color. I think she turned out great. 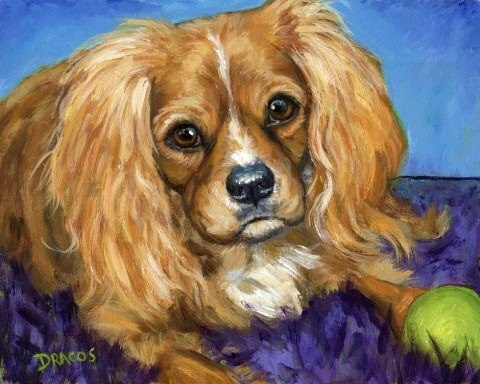 This is a ruby Cavalier King Charles Spaniel that I painted recently for a customer. The original is sold, but there are prints and pendants available. I'm going to be posting quite a few images this evening, but I don't know if they'll be in the order I produced them because I've been really busy lately and haven't had a chance even to think! Just paint. They're all within two or three weeks of each other, though, and I'll try to keep them somewhat in a chronological order -- if that matters. Oh, regarding my endeavors to be looser and brighter, it's meeting with only limited success. I manage to do one like that, and then I'm back to painting individual hairs and worrying about being nearly photo-realistic again. Gotta loosen up! This is a commissioned painting I finished about a week ago -- I've been really busy with commissions lately. That's why I haven't posted much lately. This girl's painting was a Mother's Day gift for a customer of mine. I think she turned out very nicely. Obviously, the original is gone, but you can get prints and pendants on my website. 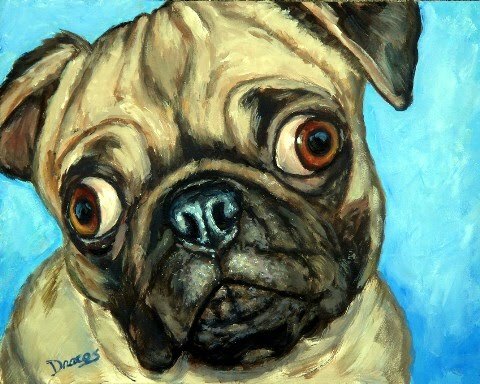 Yet another pug! This is Lola's sister - whose name I can't remember! This is the other pug I finished for my friend. Her eyes really, really are this wild looking, and my friend says she sees fine, though. Weird! But cute -- as a button! This original has also already sold, but again, prints and pendants are available on my website, http://www.dottiedracos.com/. (I'm going to gradually end using my "wildwildthings" name because it no longer reflects my current artwork. I started it when I did my ceramic animal masks, and it was great for those. But it just doesn't go with my more "elegant" work these days. (I think, by the way, I really, really have quit doing the ceramic dog/cat/fish masks - for good this time!) I have a few left that I'm selling on Etsy, and then they're gone! Forever! This is a painting of my friend's little pug, named Lola. 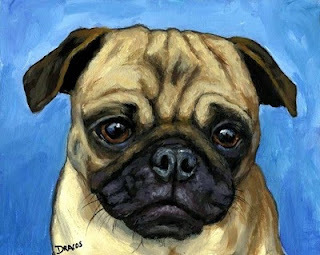 I also painted another of her pugs -- whose name I can't remember right offhand! She's coming up in the next post. 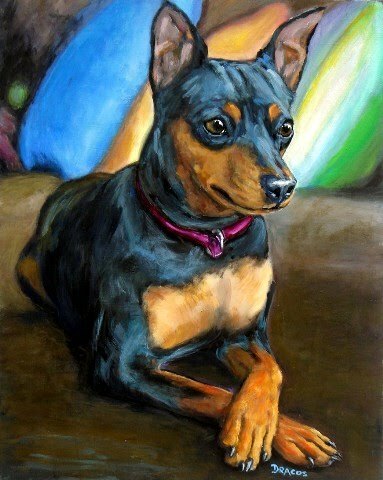 The original of Lola is already sold, but prints and pendants are available. I really enjoyed painting her - what a sweet little face. Okay, here's my painting for today - and I think I've loosened up a lot in my painting. I really love the motion, the "painterliness" of this one. I didn't draw in every single hair and be slavishly driven by the photo of the dog. I used the images of this dog to create what I feel is an exciting, colorful, filled-with-personality painting. I hope (fingers crossed!!!) I can continue in this direction!!! This painting is for sale, by the way. It's an 8x10" on wood panel, unframed. It sells for $125, and I'll frame it for you for an extra $15. Of course, as usual, prints, pendants, and clocks are available on my website, http://www.wildwildthings.com/. 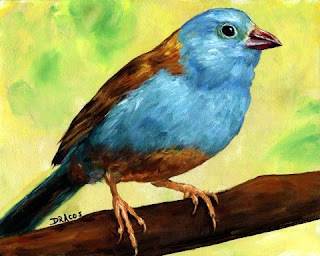 Here's my little painting from yesterday: A little finch with a fancy name: Cordon Bleu finch. I enjoyed painting it. 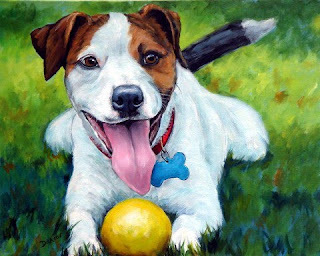 Now, today I must do another dog painting. I'm slowing returning to dogs but am still going to continue to paint other subjects, too. Wish me luck! 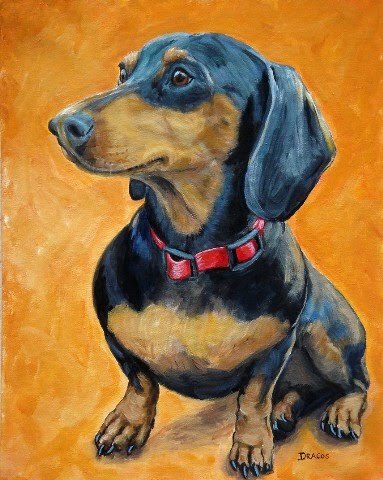 Here's a painting done by my daughter, Lara, recently. 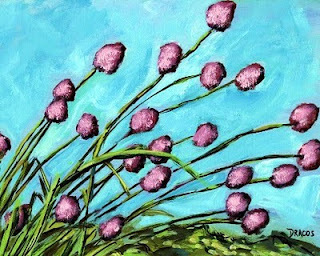 She doesn't have a blog yet, so I'm taking the liberty of listing a few of her paintings on my blog until she does - so I can show off her work, of course! 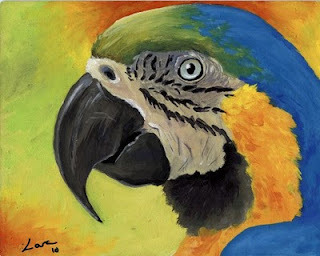 This is a parrot, obviously, a macaw, I think. 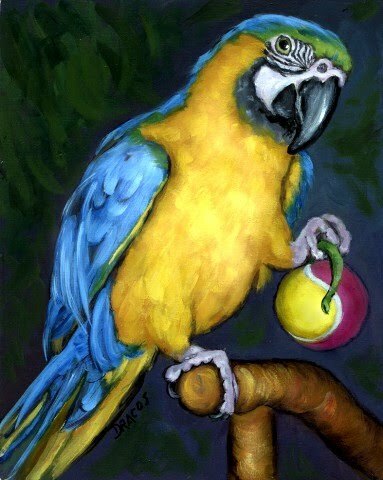 We had for many, many years another kind of parrot, a blue-fronted Amazon, named Jolie. She was a sweetheart with a voice that would break crystal! But we loved her very, very much. She left us, though, and went to live with some neighbors who had several Amazons, with whom she immediately bonded. Fickle bird! No, really, she was much happier because she was alone, with only us as companions, and she's much happier now with all the other parrots. We were really boring, I think, and didn't appreciate her fine voice nearly as much as her other bird-friends did. Here's Lara's website address: http://marezidoats.com/. The name of the site is a cute one, by the way: Lara also teaches horseback riding (dressage specifically), and the name "marezidoats" stems from a song that my mother sang to me when I was small and that I subsequently sang to her: It starts like this (written much, much more clearly than it's sung) Mares eat oats and does eat oats, and little lambs eat ivy. A kid'll eat ivy, too, wouldn't you?" 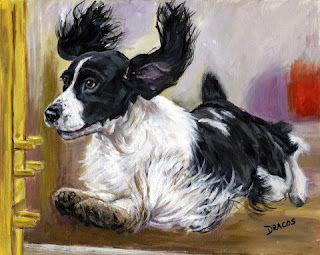 I love dogs with helicoptor ears! 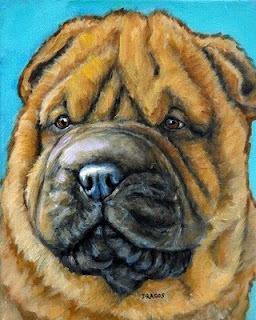 This is a painting I did from photos that were submitted to me by a person I met at the recent Rose City Classic Dog Show, here in Portland, OR. I think their ears are generally upright, and I'll eventually get one painted in that orientation. But this one I just couldn't resist. She, his mom, calls him "silly Willy" in this painting. She gave me a bit of info about Chinooks, too. They're quite rare and really are sled dogs and I think are located mostly in the Northwest US - and maybe Canada. They're really beautiful, I think. By the way, this painting is one I decided to do while in the midst of my painting anything-but-dogs phase. I'm pleased with the results -- and I think it is looser, not so serious, and was just a lot more fun to paint! So those of you waiting to have me do a commissioned painting for you, the wait will be worth it! I can tell! Some Other Paintings I've been doing lately and haven't had time to post! 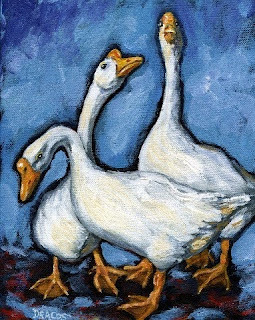 Three geese. These were actually a pet goose my daughter had, and I just took multiple photos of her and combined them together into this composition. (Geese all look alike anyway, right?) 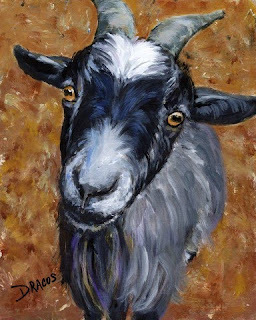 Like the goat above, she was a terror, too -- but she was actually mean! In the left two images of her in the painting, she was threatening to bite me (probably thinking about it in the right one, too, now that I think about it), and she actually did attack me before I could finish taking more photos. And geese bite hard! I finally learned not to run from her but to face her head-on and grab her mean little beak when she bit at me and just hold it until she calmed down. Finally, she didn't like to chase me anymore and chose other victims instead. 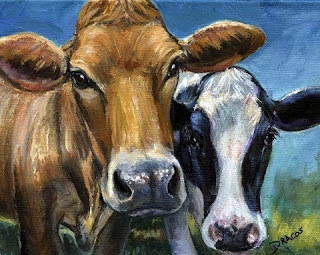 This is a painting I did recently and forgot to post of a couple of cows. I don't really know what kind they are (a jersey and a holstein possibly?) I think cows are sweet looking, though, whatever kind they are, and always seem interested in me and curious about what I'm doing. I'm not afraid of cows. Probably because I don't know any better, now that I think of it, though.